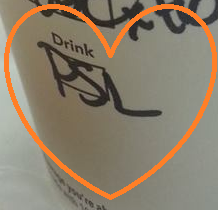 So, I have been Pinning pumpkin everything like a maniac since the day Starbucks brought back the pumpkin spice latte (PSL! ), which is always 'coincidentally' around my birthday! 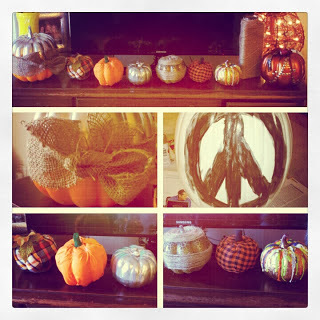 Oh, who am I kidding, I probably pinned pumpkin stuff all summer long, too. Anyway, I was overdue to actually make something, and a couple weekends ago it felt like the right time. 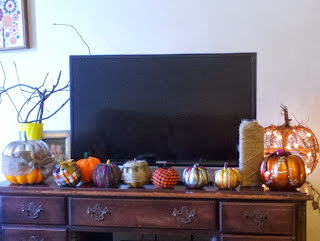 It didn't hurt for inspiration that it was also the weekend I dug my adorable pumpkins out of storage and decorated for Fall/Halloween! 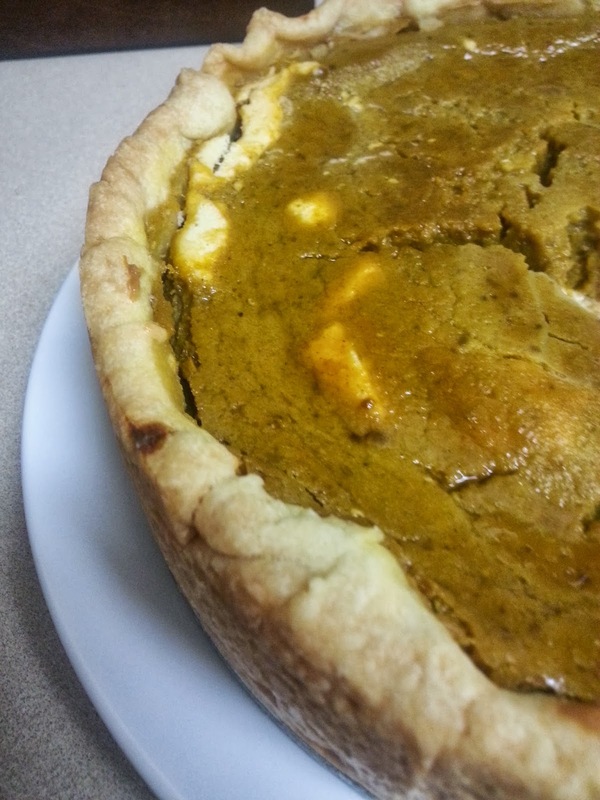 I had a 'skinny' pumpkin pie recipe I wanted to try, but it needed a little something extra. Yep. I added a bottom layer of cheesecake, sweetened with maple syrup, to my pumpkin pie! And you should do the same. Like, now! For the rest of my ingredients, I went to Skinny Taste for this great, lightened up recipe, found here. A little less sugar, a couple egg whites...all that means in my book is you can have two slices instead of one! Or have a piece for breakfast without the guilt. No? Just me? Mkay, then. On to the recipe! Trader Joes' frozen pie crust is not bad at all. Unroll room temperature dough, and lay into pie tin. Crimp edges with your fingers or a fork. Poke a few holes in the bottom with a fork. I made this in a 2" tall, 8" round spring form pan. Dude. spring form pans are awesome!! You can make this in a regular pie tin, but you might not need to use the whole bowl of either filling, as a pie tin is more shallow. Just try to judge pouring half and half of the two mixes. In a large mixing bowl with an electric mixer, beat together cream cheese, sugar, maple syrup, egg and vanilla until all ingredients are well-combined and smooth. Spoon into unbaked crust and spread carefully into an even layer. Set aside in refrigerator. Place pumpkin in a large bowl. Add butter, and mix well. Using an electric mixer, mix in brown sugar, maple syrup, milk, eggs, egg whites, pumpkin pie spice, and vanilla. Beat on medium speed until mixture is smooth. 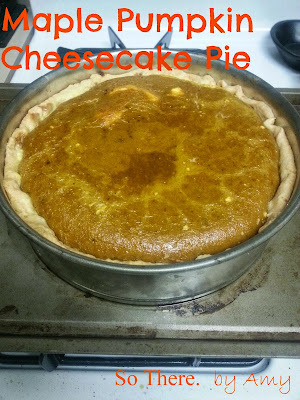 Pour filling carefully on top of the cheesecake layer in pie crust. They shouldn't swirl too much (unless you want them to!) because the pie filling is thinner than the cheesecake layer. Bake at 350 degrees for about 60 minutes, or until the filling is set and jiggles only slightly when pan is gently tapped. Let cool completely, and then chill for several hours or overnight. 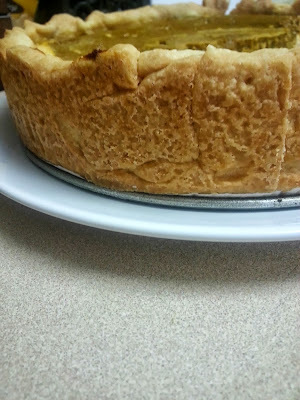 This is especially true with a spring form pan; if you unmolded the pan while the crust was warm, it might fall apart. Not 100% on that, but that was my fear. But let's be realistic, I ate about a slice and a half worth with a fork, piping hot from the oven. And it tasted amazing. 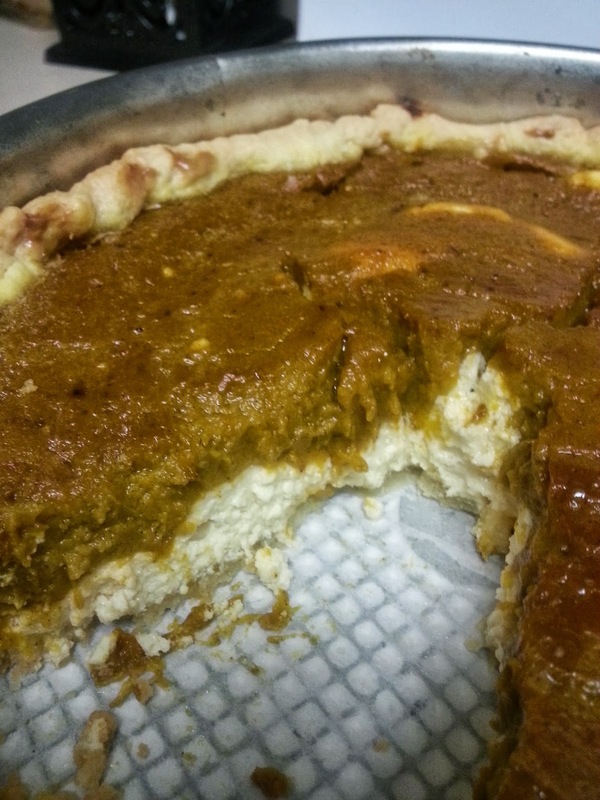 If you are half as excited as I am that pumpkin everything season is upon us, you should really make this pie! Linked up over at The Plaid and Paisley Kitchen! The tradition of weekend pancakes continues, and this past weekend two types of pumpkin definitely made their way into my breakfast! I use the Trader Joe's multi-grain pancake mix, add some almond meal and ground flax. Then, instead of the oil, I added 1/3 cup pumpkin puree, and 1/4 cup unsweetened apple sauce. 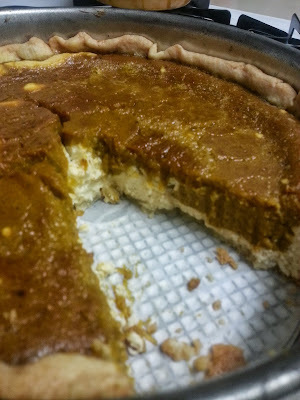 Add 1 tsp pumpkin pie spice, and start flippin the 'cakes! 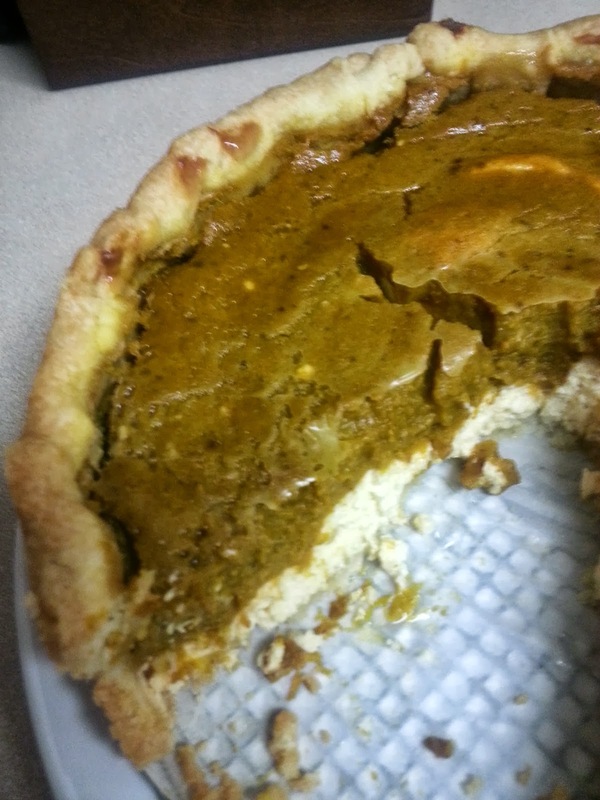 As a topping, I knew I wanted to use my pumpkin butter I had, but I also wanted to add something with some texture. Enter: plums. I deemed them a fall fruit, acceptable to pair with pumpkin. Cooked apples would also work nicely. Saute 1 sliced plum with 1 heaping Tbsp pumpkin butter, and 3 Tbsp water. Let this bubble and reduce, and pull it off the heat, right when it starts to look like a caramel sauce, but before it burns! 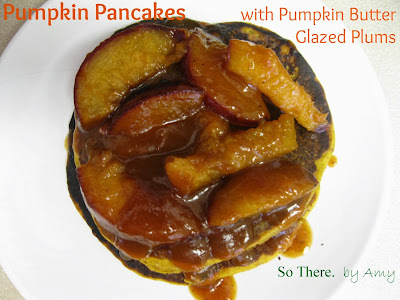 Top warm pancakes with pumpkin glazed plums. For my friend's Baby Shower, I made little jars of lavender-scented coconut sugar scrub as party favors. These were super simple to make, and make great gifts! I love these little jars - they are so cute: short and fat! Stir lavender oil into the melted, liquid coconut oil. Add sugar, and stir until completely moistened and combined. Scoop scrub neatly into jars, and seal with lid. I bought some Avery printer labels that are sized correctly for the tops of canning jars, and designed a little label for the favors. The exact labels I used are these: Avery #22818 in brown paper color. They make white ones, too, but they were so shiny, I didn't like them. Luckily the font colors I chose was still able to be seen when printed on brown kraft paper, instead of white. Avery.com actually has a design program (here) where you can design a label, from scratch or a template. I printed out these labels, and added them to the filled jars. The little guys, all lined up. We placed the jars into Chinese takeout boxes, lined with tissue paper, and added a Thank You printable card to the fronts of the boxes, to finished off the baby shower favors. These favors were a hit, and they are such a fun gift! You can make just one for yourself, or make several to give to friends as party favors or holiday gifts! Giveaway for a $300 Amazon Gift Card! 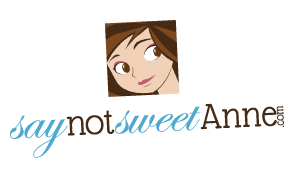 My friend Kayla over at Say Not Sweet Anne is celebrating her 2 Year Blog Anniversary with an awesome giveaway! Check out her awesome 2014 Printable Planner Here, or her cute Guest Bedroom Decor Here. 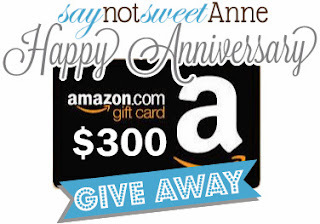 Enter below for your chance to win a $300 Amazon gift card!! Amazon is my favorite - you can really buy almost anything on there! This would be great for Christmas shopping!! Good Luck and Congrats again to Anne! I was given the honor of throwing one of my best friends a Baby Shower a couple weeks ago, and I was so excited! 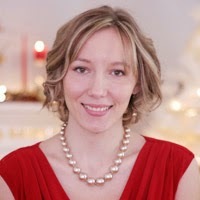 I have attended many friends' baby showers, and thanks to those, and Pinterest, I came up with some great ideas for decor, food, games, and favors! My friend and her husband decided not to find out the gender of baby, so we used their nursery colors of turquoise, yellow, and grey, with a Twinkle Twinkle Little Star theme. I bought the printed paper straws from a great Etsy shop: Loollipop! I did a candy bar, mostly to add color, but I made sure we had favor bags with twist ties, and a little candy scoop (from Party City! ), so guests could take home all the candy at the party's end. Note: don't order fragile, melt-able candy online. It is heavy, so shipping is expensive, and a lot of those candy broke or melted. Party City has a decent selection of pretty colored candy. I set out a basket of diapers with Sharpie markers for guests to write a little sentimental, or funny note on the diapers, to make those late night diaper changes a little more bearable! So excited for my beautiful friend! I can't wait to meet their little one soon!! I'm baaaaaack! For realz this time.